“Squashbucklers”—Rowers at the first annual Pittsburgh Monster Pumpkins Festival in their 1,000+ pound pumpkin boats attack the Allegheny River. One Fruity Flotilla and Whimsical Regatta! Those are “Real Pumpkins” Rowing Down River. Thousands of pounds and amazingly able to float. Uncanny, but definitely true, giant pumpkins are incredibly buoyant. 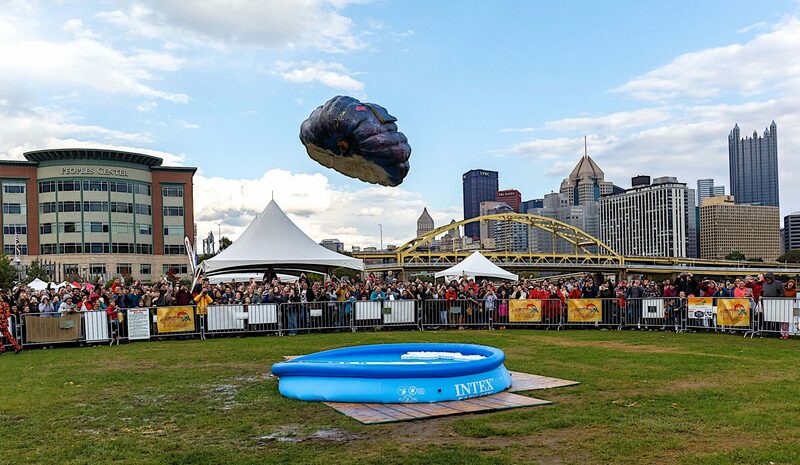 They float like a boat…and what better way to “flaunt the float” than with a race, or two, or more that pits Pittsburghers of all shapes, sizes, and status [surprise celebrities are expected] against each other in one literally colossal competition? A small cut-out allows a rower to kneel inside the pumpkin. The fruits are exceptional floaters and used in pumpkin boat races. Want to Get in the Race? Become one of the select “Pumpkin Pilots” to paddle one of these gargantuan gourds down the Allegheny and create the memory of a lifetime. Details Coming Soon! !…check back for a chance to guide a giant gourd to victory on the Allegheny River. We’ll be staging a Facebook contest soon to become one of the “Prized Pilots” chosen. Get Ready, Get Set, Get Wet! Good Luck!